Sinking pellets that remain at the bottom of the tank will often get lost and wasted. However, the floating feed pellets can retain its shape, even after being in the water for many hours, uneaten feed are still intact. Sinking pellets that remain at the bottom of the tank will eventually rot, which may give rise to proliferation of bacteria and spreading of harmful fish disease. Another reason to feed floating (extruded) pellets because the farmers can directly observe the feeding intensity of his fish and adjust feeding rates accordingly. Determining whether feeding rates are too low or too high is important in maximizing fish growth and feed use efficiency. However, sinking pellets will fall into the bottom of the tank, even fish can not find them. ◆ Feeding evenly and constantly: Flat-bottomed scraper mechanism and feeder controlled by transducer make sure that the materials can be fed evenly and constantly. ◆ High efficiency and low power consumption: With conditioner, the steam and water can be directly injected into the extruding chamber through special mechanism, thus the quality and quantity of products can be improved greatly with lower power consumption. ◆ Cutting quickly and accurately: Removable cutting mechanism use knives with good elasticity, which attach to the die plate tenderly and can be regulated in six directions, can be operated quickly and accurately. ◆ Wide application: Variably configurations of screw bolts can match the producing demands for different formulas and raw materials. ◆ Longer service life: Screw bolts and dies are processed through vacuum quench treatment, also be processed with high processing precision and have a long using longevity. ◆ Easy operation: All the operating parts like steam valves, etc, adopt the humanization design, in order to facilitate actual operations. 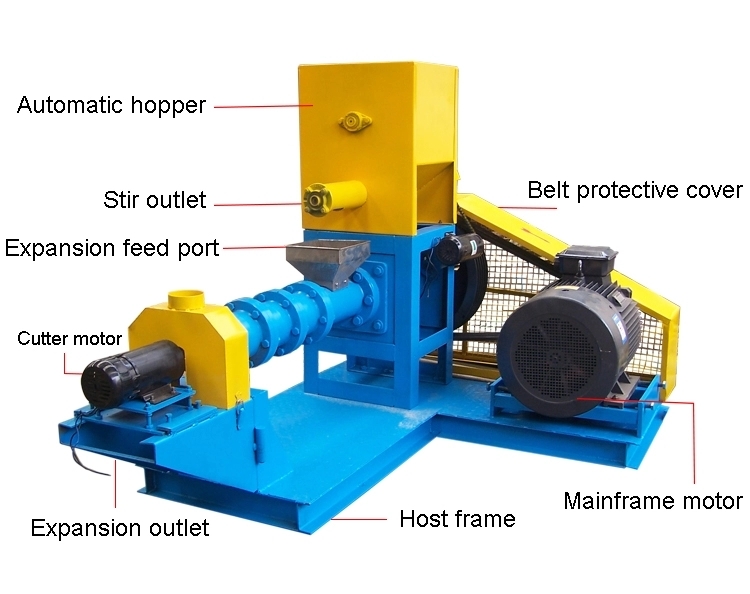 Fish feed making machine can be divided into dry type and wet type fish feed making machine according to the moisture of the raw materials. Heating the materials by the frictional force, this floating fish feed making machine squeezes raw materials out of the holes of the mold under the action of screw extruder. The pressure and temperature of the pellets sharply decreases when coming out of the machine, and the moisture evaporates. Then materials are puffed and become pellets with porous structure. During the process, the moisture ranges from 15 to 20 percent. The working principle of wet type is similar to dry type. But the former needs to add water or steam into the fish feed making machine to increase the moisture to 20 percent, or more than 30 percent during the process. It increases the temperature of the materials by steaming.